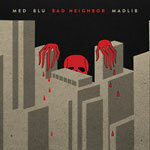 With 100% beats by Madlib, Bad Neighbor is the brainchild of MED -- a cornerstone in Stones Throw's history -- and Blu, the voice behind modern classics like Below the Heavens, who instantly clicked a decade earlier on tour with Emanon. The album is an exclamation point on the idea that began with The Burgundy EP, expanded to include Dam Funk and Mayer Hawthorne on The Buzz EP, and continued until contributions from Anderson.Paak (Dr. Dre's Compton), Hodgy Beats (Odd Future), and the one-and-only MF DOOM made Bad Neighbor ready to launch. But Bad Neighbor isn't the first time MED and Madlib's orbits have collided. A fellow head from the fertile crescent of Oxnard, CA, MED not only guested on the now-classic Soundpieces by Lootpack in '99, he also dropped into Madvillain's ''Raid'' (Madvillainy, 2004) and made his mark on Quasimoto's Unseen (2000), not to mention making the sole MC appearance on Madlib's acclaimed Shades of Blue. Madlib, in turn, provided the lion's share of production on MED's Classic and Push Comes to Shove alongside J Dilla and Oh No. Meanwhile Blu, besides earning HipHopDX's ''Rookie of the Year'' bona fides, put LA back on the map alongside Exile (Below the Heavens, Give Me My Flowers...) and as a self-produced solo artist (Her Favorite Colour, Jesus, York!, Good to Be Home).